embarrassment, Aki patiently explained to the pupil that he was created that way. “If you look around, you will see that some people are tall and others are short, even shorter than I am. I am short because God has created me this way,” he said. Meeting the actor for the first time, some of the pupils were so excited they literally pelted him with more questions. 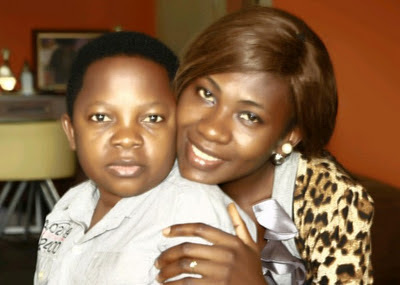 They wanted to know his actual age, if his alter-ego – Osita Iheme aka Pawpaw – was his blood brother and how he got the pseudonym, Aki. To the youngster who wanted to know his age, he said, “I am a full adult. All I can say is that I am above 20 years. I am in my 30s. When I was as young as you, one of my favourite actors was an American known as Gary Coleman. He was so short that I used to think he was a boy. I never knew he was a man.” Regarding his relationship with Pawpaw, Aki told his young ‘tormentors’ that fate brought them together. “I am from Abia State and he is a native of Imo State. We never knew each other before until fate brought us together through Nollywood,” he said. The actor advised another pupil, who wanted to know how he could become a Nollywood actor, to get good education first. He said, “The door to Nollywood is wide open and ready to admit anybody. But you need to go to school first. If you go to school, you will have a solid foundation. Most young people that are just going into Nollywood are not aware that they have to give 70 per cent of their time to education and only 20 per cent to acting. Education will help you become good actors and actresses.” Aki concluded his short ‘sermon’ by adding that despite dividing his time between his studies as a Mass Communications student of the Institute of Management and Technology, Enugu and acting in Nollywood movies, he had managed to graduate with good grades. Also, Nollywood actress, Patience Ozokwor, stunned the audience when she revealed that she had eight children. She said that while four of them were her biological children, the rest were adopted. “But I have become so used to them that I don’t regard them as my adopted children,” she added, referring to the latter. When asked why she always played the part of the ‘wicked’ woman in the movies, she replied, “I can’t get tired of answering this same question all the time. Well, I think it is because producers and directors discovered that I play such roles very well. Incidentally my fans seem to enjoy seeing me play the role of a bad woman,” she said.